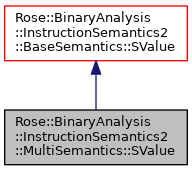 Type of values manipulated by the MultiSemantics domain. A multi-semantic value is a set of values, one from each of the subdomains, and a bit vector that indicates which values are valid. The bit vector is accessed by the RiscOperators and new values are created by those operators with appropriate validities, but the MultiSemantics domain doesn't otherwise modify the bit vector–that's up to the user-defined, inter-operation callbacks. Individual sub-domain values can be queried from a multi-domain value with get_subvalue() using the ID returned by add_subdomain() when the sub-domain's RiscOperators were added to the multi-domain's RiscOperators. Definition at line 81 of file MultiSemantics2.h. Definition at line 102 of file MultiSemantics2.h. Promote a base value to a MultiSemantics value. The value v must have a MultiSemantics::SValue dynamic type. Definition at line 107 of file MultiSemantics2.h. Create a new undefined MultiSemantics value. The returned value is constructed by calling the virtual undefined_() for each subdomain value in "this". If you want a multidomain value that has no valid subvalues, then use the create_empty() method instead. Create a new unspecified MultiSemantics value. The returned value is constructed by calling the virtual unspecified_() for each subdomain value in "this". If you want a multidomain value that has no valid subvalues, then use the create_empty() method instead. Create a MultiSemantics value holding a concrete value. The returned value is constructed by calling the virtual number_() method for each subdomain value in "this". Create a new MultiSemantics value with no valid subvalues. The caller will probably construct a value iteratively by invoking set_subvalue() one or more times. Definition at line 135 of file MultiSemantics2.h. Definition at line 139 of file MultiSemantics2.h. Determines if two multidomain values might be equal. Two multidomain values are equal if, for any subdomain for which both values are valid, they are equal in the subdomain. Determines if two multidomain values must be equal. Two multidomain values are equal if and only if there is at least one subdomain where both values are valid, and for all subdomains where both values are valid, their must_equal() relationship is satisfied. In the MultiSemantics domain, a value is a concrete number if and only if it has at least one valid subdomain value and all valid subdomain values are concrete numbers, and all are the same concrete number. Returns true if a subdomain value is valid. A subdomain value is valid if the specified index has a non-null SValue pointer. It is permissible to call this with an index that is out of range (false is returned in that case). Definition at line 179 of file MultiSemantics2.h. Removes a subdomain value and marks it as invalid. It is permissible to call this with an index that does not correspond to a valid subdomain value. The subdomain must be valid according to is_valid(). Definition at line 188 of file MultiSemantics2.h. The specified value is inserted at the specified index. No attempt is made to validate whether the value has a valid dynamic type for that slot. If the value is not a null pointer, then is_valid() will return true after this call. Definition at line 196 of file MultiSemantics2.h.